This model is exactly what you should be looking at when it comes to traveling with a larger amount of people. 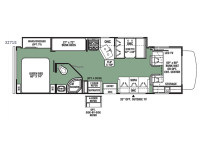 A full wall slide out, a set of bunk beds, and plenty of space to entertain a few guests are just a few of the features that you will enjoy about this Forester 3271S class C motorhome by Forest River. You will find that there are seatbelts in each of the seating options in this unit to keep your passengers safe while you are traveling. The rear bedroom gives the owners some privacy at night and there is also a convenient private entry into the bathroom as well. 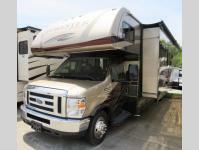 You kids will just love the bunks or the bunk over the cab for sleeping!